Hello Remodelaholics! I am Lorene, and I am thrilled to be making my first official appearance here at Remodelaholic. I work here with Cassity behind the scenes, helping with our awesome contributor team, running things over on Facebook (come say hello!) and taking care of various and sundry odds and ends while Cassity and Justin are busy tearing down ceilings and being awesome. I once dreamt of being a DIYer blogger, but for now I get my blogging fix over at Housewife Eclectic with my best friend Debra and my DIY fix from being part of Remodelaholic! Between crafting spurts (like the Doctor Who themed Christmas tree I made, yes I’m a bit of a geek!) and keeping busy with my 3 little ones (with easy creative projects like this super easy Christmas ornament advent) — I do make time for an occasional weekend project — like today’s gorgeous (if I do say so myself) ornament display tree. Update 2018: Since I made this easy triangle tree a couple of years ago, it’s been a popular Christmas project and for good reason — it’s SO easy to make, and so affordable you can make one for all the neighbors and all your friends without breaking a sweat OR your budget. Justin and Cassity also built some smaller wood triangle trees for decor, and this year, they did it all again to make a video tutorial for you. On top of seeing the whole process, it is really informative and shows how to cut an irregular angle on a miter saw, using 2×4 as a jig to get the right angle. Read the original written tutorial below (plus the story of all those purty vintage ornaments!) and watch the video here for added details — subscribe to the Remodelaholic YouTube channel for more Christmas and DIY videos! And trust me — if I can do this, anyone can do this! Just find a friend with a miter saw to make the cuts for you, and use a hack saw and vice (or something else to hold it firmly) to cut the steel rod, and then it’s a simple as drilling a few holes and gluing and nailing/screwing/stapling things together. (I opted for glue plus staples at the corners and screws in the base, and it is nice and sturdy!). I stained mine with one coat of Minwax in Dark Walnut and then tied the ornaments on using thin jute twine. Paired with our family heirloom angel, Sweet Angie, and one of dear Grandma’s nutcrackers, it makes a lovely festive and memory-filled vignette on my mantel. Just follow the building plan below for the large or small ornament tree (or both! ), and you, too, can have a beautiful ornament display — for MUCH less than buying it at Crate and Barrel! And you could easily leave this up all winter and display photos or other small decor items, too. Note: Plans are provided for a Large Ornament Tree and/or a Small Ornament Tree. If you plan on making both, purchase an extra 1″ x 2″ board and 1/8″ steel rod. Cut a piece of 1″ x 4″ that is 9″ long for the base. On the inside face of the 25 13/16″ piece, drill holes in the center and at the following locations 1/8″ diameter hole about 1/4″ deep. On the inside face of the 27″ piece, drill holes in the center and at the following locations 1/8″ diameter hole about 1/4″ deep. Cut the 1/8″ steel rod into the following lengths: 14 1/2″, 11 1/2″, 8 1/2″, 5 1/2″ 2 3/4″. Cut a piece of 1″ x 4″ that is 5 1/2″ long for the base. On the inside face of the 14 7/8″ piece, drill holes in the center and at the following locations 1/8″ diameter hole about 1/4″ deep. On the inside face of the 16″ piece, drill holes in the center and at the following locations 1/8″ diameter hole about 1/4″ deep. Cut the 1/8″ steel rod into the following lengths: 8″, 5 1/2″, 3 7/8″, 1 3/4″. 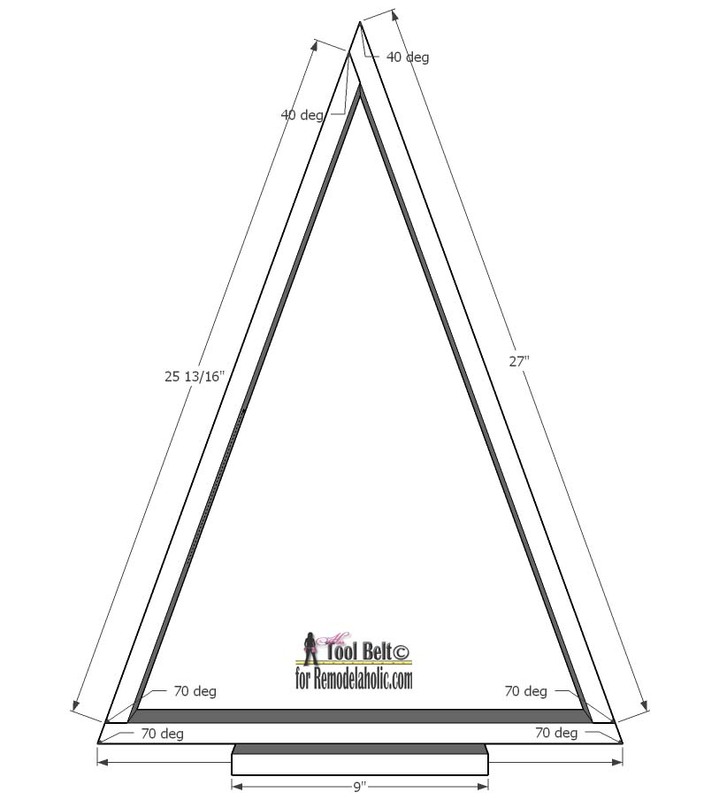 Assemble the triangle portion of the tree with the rods in place. Apply wood glue at the joints and secure with 1 1/2″ – 2″ brad nails. Use clamps to secure wood while nailing the tree together, to keep your fingers out of the way. Allow the glue to dry. Center the base on the bottom of the tree triangle, glue and screw into place with 2 or 3 – 1 1/4″ screws. Remove any excess glue, apply wood filler to nail holes, cracks and blemishes and allow to dry. Sand the wood filler and ornament tree until smooth, finishing with 120-150 grit sand paper. Stain or paint and prime as you like. Attach rings to bar with J-B weld or similar adhesive, or use twine or ribbon to attach the ornaments to the bars. Plus check out our dollar store Christmas trees — not just one but THREE of them! Plus tips for saving money on decorating a tree, no matter where you buy your ornaments. This post was originally published on Dec 8, 2014. Last updated Nov 27, 2018. A gold star for teamwork for sure! 🙂 Thanks, Ananda! Lorene you did an awesome job! I absolutely love your ornament tree, it is so beautiful. This is beautiful! How did you cut the steel rod? (What tools will I need for this whole project?) Thanks! We just used a hand saw, with the rod in a vise. Have fun and send us a pic when you’re done! Hello, we love the tree and are currently making one. Would you advise drilling holes at an angle for the rod at 1/4 inch depth? thank you for the detailed plans appreciate all your work! It looks great! Thanks for sharing your picture! Do you think I could adapt this pattern to either 5 or 6 foot tree. I do craft shows and think this would make a wonderful display. I bet you could! This would make a really cool display. Maybe using dowels as the cross-pieces? Just make sure that you size up the base as well to make sure it stays sturdy and steady. I would love to see it if you try it! I’ve made 6 sets of these trees. My friends and family really like them. I’d say the hardest part is assembly. It’s very difficult to get the proper angle to drill the holes by hand. I’ve tape-assembled the triangles first, and used a straight edge to mark a line on the side of the board to show what angle the holes should be drilled. Even so, it’s never exact and getting it all assembled and square is tricky. Helps to have a brad nail gun so you can hold the joint in place while nailing. This is crazy cute and now I want one. I’m not handy with tools but my son in law is and I’m going to see if I can get hike to help me make one of these.